With a past too terrible to speak of, and a bleak, lonely future ahead of her, Aerin Renning is shocked to find she has earned a place at the most exclusive school in the universe. Aerin excels at Academy 7 in all but debate, where Dane Madousin—son of one of the most powerful men in the Alliance— consistently outtalks her. Fortunately Aerin consistently outwits him at sparring. They are at the top of their class until Dane jeopardizes everything and Aerin is unintentionally dragged down with him. When the pair is given a joint punishment, an unexpected friendship—and romance—begins to form. But Dane and Aerin both harbor dangerous secrets, and the two are linked in ways neither of them could ever have imagined. . . . When I first started reading, my mind couldn't keep focused. I liked how Anne Osterlund opened with a strange scenario: one of our main characters, Aerin, in the middle of space, forced to send out a distress call. There's already some deep emotion hinting behind Aerin's character. Something has happened to her and somehow she's presented in such a way that you just have to know what it is. Then we have Dane. The rebel son of the General of the Alliance's army. 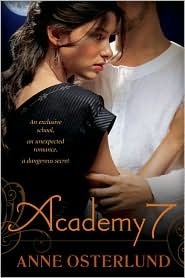 Like Aerin, he receives a letter inviting him to Academy 7, the most prestigious school in the universe. Perhaps I should have gathered from the summary that this was a science fiction novel, when I assumed that it was present day. So my mind had to scramble to readjust itself at the change of genre. I really enjoyed the romance, even if it took fooorrreeeevvvveeeerrrr for the two of them to DO anything! Reading her second novel, I realize that this is her style: not focus in entirely on the romance, but weave it into the core of the story. Furthermore, I've come to love and look forward to Anne Osterlund's fabulous plots. Just like Aurelia the plot was steeped into the history of Aerin and Dane's parents. Anne Osterlund unravels the plot masterfully in both Aurelia and Academy 7 for only having two published novels under her belt. Anne Osterlund weaves magnificent plots and crafts brilliant characters. Seeing Dane and Aerin square off against each other, both neck in neck in their class rank, was thrilling. My favorite part. Anne Osterlund has managed to give us a plot grounded in real emotions and real reactions.